I love the way Susan Sleeman's books always grab my attention from the first page! I made the mistake of picking this book up 5 minutes before I was supposed to walk out the door for an appointment! I didn't want to set it down! Darcie Stephens is an EMT on her way to care for a friend in a gang infested area when she is assaulted. This person has every intention of killing Darcie but she manages to escape and call Detective Noah Lockhart to come to her rescue. Both Darcie and Noah have hardened their hearts to any romantic involvement. They both feel the attraction they have for each other, but both refuse to act on it. Darcie trusted a man before and it didn't turn out well, plus she is still mourning the loss of her daughter, she can never allow her heart to be that affected again. Noah has a secret in his past that he knows will cause Darcie to never want to look at him again. Both are people who have been broken down by circumstances in life yet neither one can deny that maybe this time things will work out. When Darcie's name is found on a hit list Noah is determined to keep her protected. 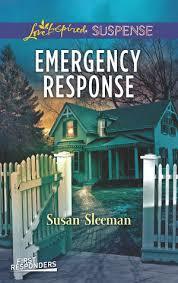 This is the 4th book in the First Responders series and like I said, it starts right out with excitement which carries out through the rest of the book. Susan Sleeman knows how to keep the reader turning the pages late into the evening! I love the exploration of the characters faith in God, the romance, the heartache, suspense, and the restoration of faith, trust and hope in Emergency Response. I highly recommend this series if you are a romantic suspense fan!